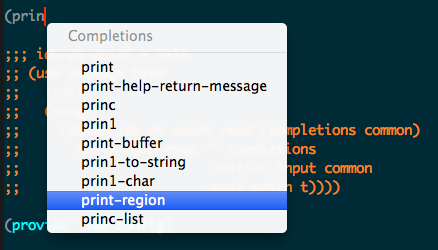 Built-in completion-at-point UI in Emacs is very simple. It’s usable – especially if you don’t mind the popup window, necessity to press tab after each letter, lack of support for asynchronous back-ends. Most of the people choose alternatives like auto-complete or company-mode. However, some people fancy ido. They prefer the flexible matching ido provides, and already use ido for finding files and switching buffers. Maybe even for M-x-ing. If only could you have ido complete your code, too. Ido is modular enough to provide it’s prompt function separately. It’s called ido-completing-read. So the rest seems trivial. Just hook into the completion-in-region-function variable, display completion-all-completions output through ido-completing-read and insert the chosen candidate, right? Suprisingly, the latter is the trickiest part. The trick with inserting a completion is that candidates sometimes come with the common part and sometimes not. For instance, in elisp-mode, if you autocomplete region-e, predictably, it will give you region-end and region-extract-function. No problem here, just remove the common part, i.e. the original input region-e, and insert the candidate. Now take shell-mode. Suppose, your input is Sites/Do. Press tab and it suggests the following candidates: Documents and Downloads. See? No common part. The good news is that candidates from completion-all-completions come propertized. The common part is highlighted with a special face property. Just look up the property span and you’ll see if you need to remove anything from the input. Subjectively, every other completions backend should do the same. Exploit the built-in Emacs completions system, while different completion front-ends can just set their own completion-in-region-function. You can download ido-at-point from MELPA. The code is on GitHub – contributions are welcome. By the way, you can override ido-at-point-read to whatever you like. For example, if you like GUI menus, this code will display candidates in technicolor.